We believe the skin, not the eyes, is the window to the soul. Skin can reveal important information about what's going on inside the body. Stress, internal illness, vitamin deficiencies, reactions to medications-- all can show up on the surface of the skin. At Premier Dermatology, MD, we take skin health seriously. Non-melanoma skin cancers (NMSC) are abnormal growths in the skin that can occur as a result of sun exposure. Basal cell carcinoma (BCC) is the most common type of NMSC. One in five adults with develop a BCC in their lifetime. Squamous cell carcinoma (SCC) is the second most common type of NMSC. Thankfully, the majority of these tumor remain localized to the skin and do not invade internally. Depending on the location, type, and size of skin cancer, they can be treated by a variety of methods. Dr. Bilu Martin is an expert in the surgical removal and treatment of skin cancers. Certain cancers are better removed with Mohs micrographic surgery. 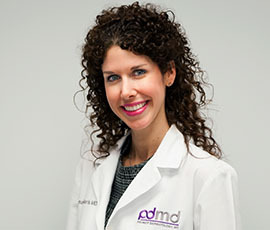 Dr. Catherine H. Balestra performs Mohs at Premier Dermatology, MD. Melanoma is a type of skin cancer that originates from melanocytes, the cells in the skin that produce pigment. It is the most serious skin cancer, however, is almost always curable if caught and treated early. Melanoma can arise from pre-existing moles, or can develop as a new lesion. Any skin lesion that is new, changing, scabbing, itching, or bleeding should be promptly evaluated by a dermatologist. Atypical moles/Dysplastic nevi are benign moles that have unusual clinical and histopathological features. Having multiple dysplastic nevi is considered a risk factor for melanoma. Regular skin exams are important for monitoring changes in moles. Actinic Keratoses are precancerous lesions that may develop into squamous cell carcinoma, a type of non-melanoma skin cancer. They usually appear as rough, red patches. Dr. Bilu Martin utilizes many treatment options for actinic keratoses, including photodynamic therapy. Acne is a condition that affects millions of women and men. It often begins in adolescence but can continue into adulthood. Hormones play a role the development of acne. There are many different treatment modalities for acne, such as: prescription topical and oral medications, chemical peels, photodynamic therapy, cortisone injections into inflamed cysts, and home skin care regimens. The use of PRP for hair growth is new in dermatology. Blood is taken, spun in a centrifuge, and the PRP is separated from red blood cells. PRP is then injected into the scalp in a series of treatments to help stimulate hair growth. PRP contains growth factors and has been used in areas of medicine for wound healing. Please note these treatments are considered "off-label" as they are not approved by the FDA. For more information, please schedule your consultation with Dr. Bilu Martin at (305) 521-8971. Psoriasis is a common chronic skin condition that is thought to likely have an autoimmune cause. In addition to skin involvement, joints can be affected. Treatment options include topical prescription creams, oral medications, light therapy, and injectable biologic treatments.